Home »The Bigger Picture»New Federal Energy “Corridors:” Just What Are They? Our federal energy policy is really a large trough arranged by the hogs for their convenience. Energy, including electrical energy, is essential for civilization as we know it. Today, America gets some 54% of its electricity from coal power plants and another 22% from natural gas power plants. With the possible exceptions of the production and distribution of food and water, no human activity has a greater impact upon the environment, the economy, and the way we live than how we produce and distribute energy. The Energy Policy Act of 2005 mandates two new types of energy corridors: Section 368 instructs the Secretaries of Energy, Interior, Agriculture, and Defense to work with stakeholders (including energy companies) to designate two-thirds-mile-wide energy corridors for oil, gas, and hydrogen pipelines, electricity transmission lines, and other energy infrastructure on public lands. Each corridor could hold as many as nine electric transmission lines and 35 petroleum and 29 natural gas pipelines. The draft environmental impact statement (DEIS) for the West-Wide Energy Corridor indicates that this “corridor” would extend 6000 miles across eleven Western states and cover 3 million acres of federal land. What’s 3,500 feet wide, 6,055 miles long and 2.9 million acres big? That’s wider than Hoover Dam, bigger than Yellowstone National Park and almost three times as long as the Mississippi River? This behemoth goes by the name of the West-Wide Energy Corridor, and if you live in the West it could soon devour a landscape near you. So far, what appears to be a land grab has received little media attention. The West-Wide Energy Corridor designates 6000 miles of 2/3 mile-wide corridors that would cover about 3 million acres of federal land in 11 states, including Colorado, Arizona, New Mexico, Utah, Wyoming, Montana, Nevada, California, Oregon, Idaho, and Washington (Figure 1). Note that a 2/3-mile-wide corridor would be the equivalent of nearly 12 football fields placed end to end! Figure 1. West-Wide Energy corridor proposed in 2007 draft Environmental Impact Statement (DEIS). In November, 2007, a 1,000+ page “West-Wide” draft Environmental Impact Statement (DEIS) was released by the U.S. Department of Energy (DOE), the Bureau of Land Management (BLM), and thirteen cooperating agencies, including the U.S. Forest Service (USFS), U.S. Department of Defense (DOD), U.S. Fish and Wildlife Service (USFWS) and the State of Wyoming. The document does not specify how DOE intends to extend the transmission corridors across state and private land. And it does not include project-specific activities at this time. Now, apparently, it’s so critical to get this thing nailed down, that the plan is being fast-tracked… A path averaging 3,500 feet wide, taking up 6,000 miles and almost 3 million acres of public land alone– for what national purpose? The trouble is that local and regional organizations are still struggling to grasp the outlines of this sweeping land use proposal, which not only affects federal lands but the privately-owned land– the ranches and farms and the communities– which lie between those federal holdings. Representative Raul Grijalva (D-AZ), chairman of the subcommittee on National Parks, Forests, and Public Lands, stated: “(The Corridors) seem to act like huge extension cords to existing coal power plants with the opportunity through these corridors to make new coal power plants.” A Wilderness Society spokesperson agrees, noting: “The proposed energy corridors show the administration’s multi-billion dollar grid to be little more than a network connecting existing and proposed coal-fired power plants that bypass many areas rich in renewable energy potential” (Figure 2). Similarly, Nada Culver of The Wilderness Society explained: “The corridor locations were created from an original “wish list” proposed by industry and bisect many important and sensitive places, including places that are designated conservation areas and would be expected to be protected from such intrusions.” The Wilderness Society’s analysis indicates that the proposed corridors threaten six national wildlife refuges, three national parks, seven national monuments and more than 60 current and proposed wilderness areas. Among the impacted special areas are the Havasu National Wildlife Refuge on the Arizona/California border, Joshua Tree National Park, California, Grand Staircase National Monument in Utah, New Mexico’s Sevilleta National Wildlife Refuge and Arches National Park, Utah. …a network of cracks spreading across the West, from Puget Sound to El Paso, and from San Diego to the Little Bighorn. On these maps, our beloved West looks like a shattered and poorly mended dinner plate. And that is an entirely accurate image. These new energy corridors – averaging six-tenths of a mile wide – will fracture a landscape that is already a maze of hairline cracks – the lines made by highways, railroads and the current, comparatively delicate energy rights-of-ways. These existing corridors have been enough to severely fragment habitat in the West, interfering with the movements of pronghorn, elk and bison, denying undisturbed wild areas to wolves and grizzly bears, and weakening the ecological health of deserts, grasslands and forest. The Colorado portion of the DEIS maps show several main corridors. One runs east-west along Highway 50 from Grand Junction through Salida to just east of Pueblo, where it mysteriously stops. The major north-south corridor traverses western Colorado from Mesa Verde National Park in the south to near the northwestern corner of the state. Smaller corridor segments stretch across federal land from west of Denver to about Hot Sulfur Springs and from about Rifle north into southern Wyoming. Higher resolution maps reveal large gaps in the designated corridors where they cross state and private land. DOE, however, is not providing information regarding the likely locations of these connections to the public. Then there’s the contentious issue of property rights. On the maps, the lines representing the corridors are frequently interrupted, only to pick up again after a gap. Those gaps are private land; the map shows only the rights-of-way proposed for federal land. Obviously, those gaps must be filled in, and if you happen to be a landowner in the way, watch out! The Energy Department needs to seriously evaluate alternatives to minimize the number of corridors and maximize the use of renewable energy, and it should include requirements to presumptively limit all projects to designated corridors. The Energy Department has this one chance to get these corridors right and to improve access to renewable energies, such as wind and solar. With appropriate planning, they could address our transmission needs while also avoiding sensitive protected lands. …. The proposed corridors still lack thorough consideration of the likely damage to federal lands and other places. The designations still don’t provide justification for the siting of corridors or information on the location and sources of energy to be moved through the corridors. The corridors can draw damaging development to areas where there might have only been a power line before. There are no exceptions for places already identified for protection, such as wilderness, wildlife refuges, parks and historical sites. This process will amend more than 160 land-use plans and permit projects with lesser reviews. We are concerned generally with the broad swaths of land under the proposed action alternative and with the statement that, should applicants wish to apply for lands outside of the corridor, they may do so. That, combined with the “no effect” meaning… raises the question of the purpose of the corridor designation in the first place. On October 5, 2007, DOE published its orders designating two National Interest Electrical Transmission Corridors (NIETCs). These corridors are located in two of America’s most populous regions, purportedly in response to data and analyses that show consistent “congestion” in these regions. The Mid-Atlantic Area National Corridor encompasses 116,000 square miles (over 74 million acres) that include the metropolitan areas of Washington, D.C., Baltimore, Philadelphia, and New York City, as well as 47 counties in New York, 50 counties in Pennsylvania, all of New Jersey, Delaware, Maryland, and the District of Columbia, and large portions of Ohio, Virginia and West Virginia (Figure 3). Some 49 million Americans live within the affected area. Figure 3. The designated “Mid-Atlantic National Area Corridor” (from www.maccec.org/). DOE failed to conduct an environmental impact statement of the proposed activity, as required by the National Environmental Policy Act. Nor did DOE consult with the U.S. Fish and Wildlife Service to identify and mitigate effects to the 95 threatened or endangered species that would be affected by the mammoth project, as mandated by the Endangered Species Act. The designation of the mid-Atlantic NEITC, which covers an area from the Canadian border to West Virginia, will have devastating effects on the lives of people and prevent state and local governments from taking a critical look at proposals for power line construction. These are places completely inappropriate to site transmission lines, for both human health and ecological value reasons. These corridors amount to a handover of states rights to the private interests of power companies. Supporters of so-called “national interest corridors” should have to demonstrate that new transmission lines are the only reasonable solution to meeting energy needs before federally-sanctioned seizure of property is considered. We need an energy plan that both addresses our 21st century challenges and takes advantage of 21st century technologies. Local generation, demand-response and energy efficiency most likely can meet our energy needs faster and more cheaply than huge new power lines. And these technologies can meet our needs without harming communities. The Mid-Atlantic Area National Corridor also includes 35 national park units, including Gettysburg National Military Park (PA), the Upper Delaware Scenic and Recreational River (NY and PA), Shenandoah National Park (VA), Cedar Creek and Belle Grove National Historical District (VA), and the Appalachian National Scenic Trail (ME to GA). In addition, the “corridor” would take in Antietam National Battleflied (MD), Monocacy National Battlefield (MD), C&O Canal National Historical Park (MD, WV, and DC), Schuylkill River National Heritage Area (PA), Delaware and Lehigh National Historic Corridor PA) and the proposed Journey Through Hallowed Ground National Heritage Area (PA, MD, VA, and WV). 4) Designated energy corridors contain strong mitigation measures, to address adverse affects on view-sheds, water quality, wildlife habitat and corridors, and native plants. The Mid-Atlantic Concerned Citizens Energy Coalition includes on its website (www.maccec.org) many affected parties’ petitions requesting that DOE reconsider their Designation Order for the Mid-Atlantic Area National Interest Electric Transmission Corridor. These include petitions by Maryland’s Governor Martin O’Malley, Delaware’s Lt. Governor John C. Carney, Jr., the New Jersey Board of Public Utilities, New York Attorney General, Andrew M. Cuomo, the New York State Public Service Commission, The New York State of Department of Environmental Conservation (DEC), Communities Against Regional Interconnect (CARI), Pennsylvania Governor Edward G. Rendell, Pennsylvania Majority Leader Bill DeWeese, Pennsylvania Senator J. Barry Stout, and Virginia Governor Timothy M. Kaine.. These letters and petitions are worth reading. The New York State Public Service Commission (NYSPSC) notes that in making its Designation Order, DOE relied on erroneous data in the ‘Congestion Report’ produced by its consultants, CRA International, Inc. Despite the fact that numerous reviewers, including NYSPSC, have called this report into question, DOE has not answered these concerns or verified the factual basis of the Report on which it has based its Designation Orders. …. until after it has analyzed whether alternative measures, including energy efficiency, demand response, and clean local generation within the critical congestion area could relieve congestion more effectively, at lower cost, with less harm to the environment, with better assurance of the reliability and security of our electric supply, or with less vulnerability to uncertainties such as future fuel costs, future environmental requirements, and other variables. … the Designation Order is contrary to law, in excess of DOE’s statutory authority, and fails to observe procedure required by law. Specifically, DOE failed to consult with Virginia in conduct of the congestion study that served as the basis for its NEITC designations, in contravention of its explicit legal obligation to do so. Therefore, DOE’s designation of the Mid-Atlantic Area NIETC is unlawful. The Federal Energy Regulatory Commission’s ability to disregard a state’s evaluation of a proposed project challenges Pennsylvania’s rights. FERC may force Pennsylvania to accept projects that are far from the best choice. These transmission lines will be on our soil, depreciate our property values, but they may not benefit our consumers. This is simply unacceptable. 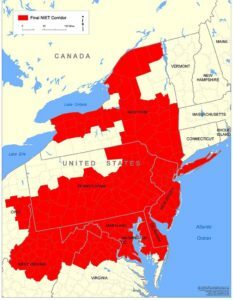 Similarly, Daniel Griffiths, head of Pennsylvania’s Bureau of Energy Innovations and Technology Deployment, questioned whether a corridor that includes 50 of Pennsylvania’s 67 counties is realistically related to actual transmission options. He noted that the proposed routes bypass parts of Pennsylvania where clean, new generation is coming online, and instead pulls power from old, dirty plants to the east and south of the state. Maryland’s Governor Martin O’Malley also expressed concern about the expansive geographic scope of the draft designation, noting that 1) the NIETC encompasses an enormous geographic area, encompassing nearly all the State of Maryland and thus, is far from a “corridor,” as that term is commonly understood, 2) the designation appears to go beyond the intent of the 2005 Energy Policy Act, 3) a much more refined corridor designation may be appropriate, 4) DOE failed to make adequate efforts to work with the State of Maryland and its citizens in studying and formulating solutions to electric transmission congestion, and 5) DOE failed to property consider non-transmission solutions to congestion and constraint issues. .. (the proposal) runs counter to forward thinking energy policies to promote sustainable “green” energy alternatives that are right for Delaware and the nation. It also hinders the goal of increasing local energy generation to improve reliability and protect consumers from future price shocks like the one Delaware experienced earlier in this decade. And the proposed new corridor does nothing to reduce energy demand, either through improved efficiency of infrastructure or conservation. By linking the coal-fired electric generation plants to our west with the high-demand mid-Atlantic region, this plan will create more dependence on heavily polluting sources of electricity at a time when we should be promoting cleaner alternatives. changed the balance of power between State and Federal jurisdiction in the field of energy transmission… creating a new scheme of federal regulation over traditionally-exercised State authority related to siting and approval of electric transmission lines. Prior to issuing the Designation Order, DOE did not prepare or issue for public notice and comment an environmental assessment (“EA”) describing the proposed designation as required by its own NEPA regulations. Nor did DOE conduct an environmental impact statement (“EIS”) as required by NEPA and its own regulations… Furthermore, the Designation Order is beyond DOE’s authority under Section 216 and the APA. DOE’s response to these requests for a rehearing or reconsideration of their Designation Order was to issue an Order Denying Rehearing on March 11, 2008 (http://nietc.anl.gov/documents/docs/Order_Denying_NIETC_Rehearing.pdf ). Thus, it is hard to avoid the conclusion that this plan was hatched in secret by a cabal of industry/government insiders in defiance of numerous federal and state laws for the benefit of energy companies. Because the plan violates federal law, the U.S. Constitution, States’ rights, and private property rights, it clearly comprises a crime against the American people. Currently, eleven national and regional environmental organizations, led by the National Wildlife Federation, are filing suit against DOE over its final designation of the Mid-Atlantic National Interest Electric Transmission Corridorhttp://www.depweb.state.pa.us/news/cwp/view.asp?Q=533025&A=3&ppp=12&n=1). The groups are challenging the designation on the grounds that DOE violated the National Environmental Policy Act and Endangered Species Act by failing to study the potential harmful impacts of the corridor on air quality, wildlife habitat and other natural resources. The suit also claims that DOE violated the requirements of the Energy Policy Act of 2005 by: 1) defining boundaries which extend far beyond the areas where transmission congestion or capacity constraints are alleged to occur, 2) the “Congestion Study” upon which corridor designation is purportedly based was procedurally flawed because DOE failed to consult with affected states before finalizing it, and 3) in the Designation Order, DOE failed to consider non-transmission or other alternatives. Finally, the suit charges that DOE designated the corridor without taking into account the potential effects on historic properties or engaging in the consultations mandated by Section 106 of the National Historic Preservation Act. The Department of Energy has ignored the public interest in favor of the private interests of power companies. Our federal government should be working to find solutions that protect our natural heritage and promote a clean energy future so that our children and grandchildren will have a healthy communities, clean air and abundant wildlife and wild places to enjoy. DOE has failed to do even the basic due diligence and analyze responsible and cost effective alternative ways of meeting the region’s energy needs. Efficiency and conservation should be the first order of business…. The mid-Atlantic corridor designation puts and enormous area of the region at risk while sending our energy policy a major step backwars towards continued reliance on coal-fired generation. It’s not a corridor. It’s an entire area of the country. It’s hard to see which Western constituency could possibly support this. But the answer of course, is that the constituency that supports this doesn’t live in the West. It lives on Wall Street and in C.C. and it is attempting, essentially… to sell off as much of our public land as possible for energy development before public outcry rises to the degree that such policy choices will not be tolerated. On October 5, 2007, DOE also designated the Southwestern Energy Corridor as another NIETC that would encompass the Los Angeles, San Diego, Las Vegas and Phoenix metropolitan areas as well as large portions of southern California, Nevada, Arizona. 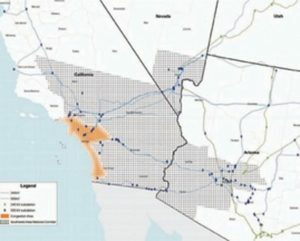 Specifically, this “corridor” would encompass 70,000 square miles (44.8 million acres) that includes, seven counties in southern California, three counties in southwestern Arizona (Figure 4). Figure 4. DOE’s designated Southwestern Energy Corridor in southern California, southern Nevada and southwestern Arizona. The 45-million-acre ‘corridor,” drawn to include urban areas where electricity is needed as well as outlying areas where power is produced, stretches from the Mexican border to well north of Los Angeles and east to Phoenix. It includes 3 million acres of national parks, monuments and national wildlife refuges including Joshua Tree National Park, the Kofa National Wildlife Refuge, Sonoran Desert National Monument, and Carrizo Plain National Monument. This vast “corridor” also includes 21 million acres of the California Desert Conservation Area, 750,000 acres of BLM national monuments, and a part of the Las Californias, an internationally recognized biodiversity hotspot that is home to hundreds of protected or rare species. Altogether, the designated “corridor” includes 7.5 million acres of federally designated wilderness, wilderness study areas and citizen-proposed wilderness. And it includes at least 95 species that are listed as endangered or threatened with extinction under the Endangered Species Act. Since this is also a National Interest Electrical Transmission Corridor, when utilities propose transmission lines and state regulatory agencies either reject them or put off action for long periods, they can ask the federal government to step in and review those projects. Thus, for example, San Diego Gas and Electric could become the first utility in the nation to ask the Federal Energy Regulatory Commission to intervene in what has traditionally been a state process for evaluating projects. And again, if FERC were to approve the utility’s application, it could impart eminent domain authority to SDG&E, a private corporation, to condemn private lands needed for the project. As in the Mid-Atlantic Corridor, DOE failed to do an environmental analysis or environmental impact statement, as required by the National Environmental Policy Act (NEPA). 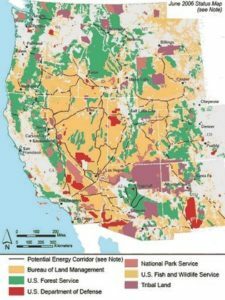 On January 11, 2008, the Center for Biodiversity Management (CBM) filed suit in federal court in California to challenge DOE’s designation of the Southwestern Electric Transmission Corridor. The lawsuit, filed by the Western Environmental Law Center, charges that DOE failed to analyze environmental impacts of the proposed corridor as required by NEPA. 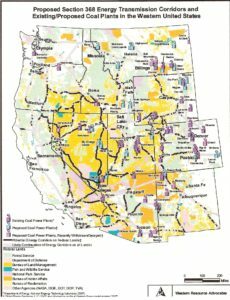 According to the Western Environmental Law Center, the DOE designation of the Southwest electrical transmission line corridor that allows for “fast track” approval within the corridor is an attempt to nullify state and federal environmental laws and enable energy companies to condemn private land for new high-voltage transmission lines. DOE has determined that these designations will remain in effect until October, 2019 unless the designations are rescinded or renewed. Just what are these new proposed corridors and who would benefit from them? 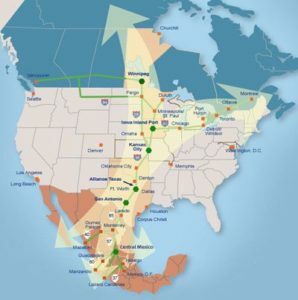 The proposed West-Wide energy corridors are almost three times wider than the proposed 1200’-wide Trans-Texas Corridor (TTC), which is part of the “NAFTA Superhighway” that would extend from southern Mexico to Canada. NAFTA (North American Free Trade Agreement), of course, is a series of trade agreements and treaties between the U.S., Canada, and Mexico that passed the U.S. Congress via “fast-track” in 1994. The North America Super Corridor Coalition, Inc. (NASCO) website shows the NAFTA superhighway extends from Lazaro Cardenas, Mexico to Kansas City, and into Canada, where it branches out to Vancouver on the west coast and Montreal in the east (Figure 5). In The Late Great U.S.A.: The Coming Merger with Mexico and Canada, Jerome R. Corsi notes that the 4000-page Environmental Impact Statement (EIS) for the TTC reveals that the 1200’-wide complex involves 10 lanes of highway, with five lanes in each direction, of which 3 lanes are for passenger vehicles and 2 lanes are for trucks. The EIS also includes 6 rail lines running parallel to the highways, with separate rail lines in each direction for high-speed rail, commuter rail, and freight rail. The design also calls for a 200’-wide utility corridor that includes pipelines for oil, natural gas, and water, cables for telecommunications and data, and electricity towers (Figure 6). Figure 6. Texas Department of Transportation drawing of proposed TTC. Certainly, if all these transportation and energy facilities can be contained within 1200,’ one must question the need for 3500’-wide corridors. Like the West-Wide corridors, the TTC is designed to be an alternate to the existing interstate system. Indeed, it is to be a separate toll-road that abandons the existing interstate structure without attempting to supplement it. Under Republican Governor Rick Perry, TxDOT (Texas Department of Transportation) has contracted the construction and maintainence of the TTC to a Spanish multinational corporation, Cintra Concessiones de Infraestructures de Transport – or “Cintra”) which is forming a partnership with the San Antonio-based, Zachary Construction Corporation. According to Corsi, the TTC the beginning of a continental network designed to move inter-modal goods that derive from global trade. 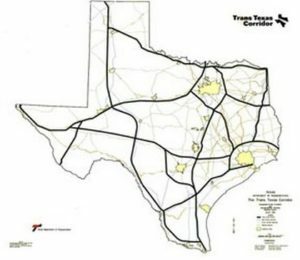 Whereas the West-Wide energy corridor would carve up 11 Western states with some 6000 miles of 3500’-wide corridors, the TTC calls for building 4000 miles of highway/railway/utility superhighways in Texas over next 50 years at a cost of $184 billion. The 4000 miles of TTC criss-cross Texas and circle every major city, including San Antonio, Austin, Houson, and Dallas-Fort Worth (Figure 7). Figure 7. 4000 miles of projected TTC in Texas. Like the West-Wide energy corridor, the TTC will cut communities in half; people will have to drive tens of miles to get to the nearest overpass to see a neighbor or get to the other side of their ranches. And like the West-Wide energy corridor, the TTC will involve wholesale confiscation of Americans’ private property. According to Corsi, it will involve about one million eminent domain notices and will destroy some 584,000 acres of what is now farm and ranchland. These farms and ranches have produced food for America for generations. In Supreme Court case Kelo v. City of New London (545 U.S. 469 (2005), the Supreme Court decided that eminent domain could be used to seize private property from U.S. citizens even though the purpose of the land seizure was to benefit a private corporation. The decision says nothing that specifies that the corporation need be a U.S. corporation. In addition, a Texas state law (HB3588) allows a “quick-take seizure” of private property “if TxDOT (Texas Department of Transportation)and the property owner cannot reach an agreement” on just compensation for the land involved. Under current Texas state law, TxDOT can seize a property on the 91st day after the landowner is served with an official notice of quick take. Similarly, according to the Energy Policy Act of 2005, after DOE designates a NIETC, when utilities propose transmission lines and state regulatory agencies either reject them or put off action for over a year, the utilities can ask the federal government to step in and review those projects. Thus, for example, San Diego Gas and Electric, a private corporation, could ask the Federal Energy Regulatory Commission (FERC) for eminent domain authority to condemn and seize the private lands needed for the project. Finally, and perhaps most revealingly, the new energy corridors and the TTC were all railroaded into law in an extremely anti-democratic manner, through stealth and secrecy, and in violation of many existing state, local, and federal laws. Each of these projects seem to have involved essentially Soviet-style central planning with no meaningful democratic participation from ordinary citizens or even from Congress. They are proceeding against the will of the American people. All of these projects are direct attacks on private property, state’s rights, and the U.S. Constitution. As such, these projects seem to be intended to hand over vast portions of America to a relative handful of multinational corporations. Dr. Jerome Corsi makes the case in his book, The Late Great U.S.A., that the TTC is part of the larger corporate plan to merge the U.S. with Canada and Mexico in a North American Union. Such a merger would destroy the U.S. Constitution and the civil liberties that Americans have enjoyed for over two centuries under the Bill of Rights. If we value our country, our democracy, and our U.S. Constitution, we would be well advised to get informed and organized, and defeat these “corridor” projects as presently defined. We can find solutions to these and other perceived problems that do not jeopardize the U.S. Constitution or the sovereignty of the American people, state’s rights, and the American republic. Authors postscript: I began graduate work in Geography at the University of Wyoming in 1975. In an independent project for a course entitled “Geographic Location Analysis,” I used sophisticated computer programs to determine the optimal location of coal-fired power plants in the West. Because the costs of energy losses through long-distance transmission lines are considerably greater than the costs of transporting coal by train, it turns out that the most cost-effective place to site coal-fired plants is where the power is actually needed, i.e., in Los Angeles, Phoenix, Las Vegas, etc. But of course, then as now, state pollution laws prohibited this and so dirty coal power plants were sited, instead, in some of the most pristine areas in the West where the air quality was still excellent. It seems this very fundamental lesson has still not been learned by the energy industry or by the American people.